Not too far away from a beautiful beach called "Cala Canyelles". The location of the campsite is fantastic which is why we have visited many times as a family. I'm by no means a frequent camper, and it was my very first experience in Cala-Gogo. The infrastructure, (which is electricity, water, wireless, and waste collection) was very well organized. I am definitely planning to book next summer, and this time with less stuff (as almost everyting is available in your camp) and with my 8 years old daughter. Thanks for everything. The Cala Canyelles campsite is located very close to the beautiful Cala Canyelles. The campsite has ample plots for tents and caravans, as well as accommodation prepared for a holiday or some weekends. Inside the campsite you can enjoy our apartments. From the small STUDIO for 3 people till the FAMILY apartment of 5 people. 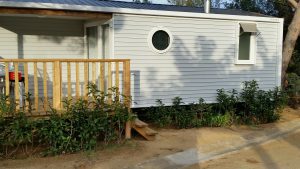 As a novelty 2017, Cala Canyelles campsite installs the new two-room GARBI Mobil Homes and the spacious three-room OCEAN Mobil Homes. Do you know “glamping”? It is the new way of doing camping. Our establishment has various types of accommodation in Glamping such as the wonderful and spectacular Lodge Tent with 2 rooms. Plots for caravans, camper vans and tents, all with electrical connection, located throughout the campsite. Some with beautiful panoramic views over the Mediterranean. Supermarket with wide assortment. Bakery, with bread and freshly baked pastries. Bar-restaurant by the pool, with great views of the Mediterranean. Free transport from the top of the campsite to the beach (mid and high season. Washing Machines and Dryers. 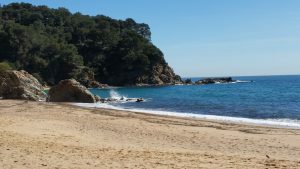 The campsite is located near of the one of the most beautiful coves of Girona. 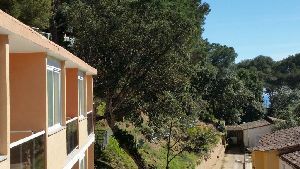 Cala Canyelles is located between Lloret de Mar and Tossa de Mar, on a beautiful and calm winding coast. The bustling town of Lloret is just 4 km away of the campsite, where you will find the widest range of restaurants and shops. The campsite is very close to the wonderful Cala Canyelles. 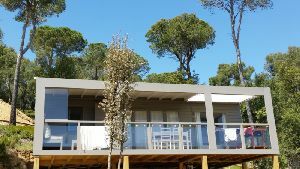 Enjoy a pleasant stay at the Cala Canyelles campsite, situated just 200 meters from the cove, between Lloret de Mar and Tossa de Mar, with stunning views over the Mediterranean.